In the previous article (http://ponnadi.blogspot.in/2012/12/charamopaya-nirnayam-uththaraka-acharyas.html) we have seen the 3 uththAraka AchAryas and among the 3 of them, how emperumAnAr fully manifests the uththArakathvam. Now, we will continue on with the next section where the various AchAryas of udayavar establishes his uththArakathvam. Further, AchArya dhivyasUkthis (divine words) that establish emperumAnAr's uththArakathvam are discussed now. periya nambi, being seated under the maghizam tree at madhurAnthakam ErikAththa perumAL temple, as per kUrma purANam "chakrAdhidhAranNam pumsAm parasambhaNdhavEdhaNam" (சக்ராதிதாரணம் பும்ஸாம் பரஸம்பந்தவேதநம்) meaning "Wearing chakram,etc shows the relationship with emperumAn just like a pathivrathai (a dedicated wife) will wear bangles, etc which shows the relationship with her husband" and as per prapannAmrutham "Evam prapadhya dhEvEcham AchArya: krupayA svayam| adhyApayEN maNthrarathNam sarshichchaNdhOdhi dhaivatham" (ஏவம் ப்ரபத்ய தேவேசம் ஆசார்ய: க்ருபயா ஸ்வயம்| அத்யாபயேந் மந்த்ரரத்நம் ஸர்ஷிச்சந்தோதி தைவதம்) meaning "An AchAryan, out of his divine mercy, first establishes bhagavath sambandham to the sishyan and performs manthrOpadhEsam of mUla manthram which has rishi, chandhas and dhEvathai" (any authentic manthram will have a rishi (revealer), chandhas (meter) and dhEvathai (the object of worship for the manthram), he first performs samAshrayaNam and then performs dhvaya mahA manthrOpadhEsam. He then says "I am not performing samAsrayaNam to become an AchAryan myself, but because you are very dear to my AchAryan ALavandhAr. You are a great personality since AzhwAr himself identified that kali will be destroyed after your appearance. I did it to have your sambandham as well. Just like perumAL (srI rAman) appeared in the sUrva vamsam and took the greatness of that vamsam to great heights and just like janaka mahArAjan declared that sIthA pirAtti will bring great glories to his kulam (family), because of your avathAram, this prapanna kulam is going to reach great heights. You are the uplifter for all. I have full faith in this and keep meditating on this". periyavAchAn piLLai identifies that these words are the essence of our sampradhAyam. 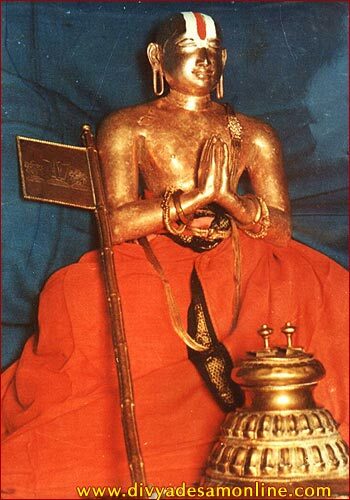 udayavar stayed in periya thirumalai nambi's thirumALigai (at thiruppathi) for 1 full year and heard srI rAmAyaNam which is glorified as ithihAsa srEshtam (the best of ithihAsams). When the following slOkam is explained by nambi, udayavar asks him a particular question. One who does not see srI rAman and one who is not seen by srI rAman in this world is unfortunate. His own self will curse him. Hearing this emperumAnAr asks nambi, for such unfortunate persons who are cursed by both self and others, what is the only hope? nambi replies "The abhimAnam (katAksham) of Your highness (who is the leader of nithyasUris) is the unbounded hope for their upliftment". 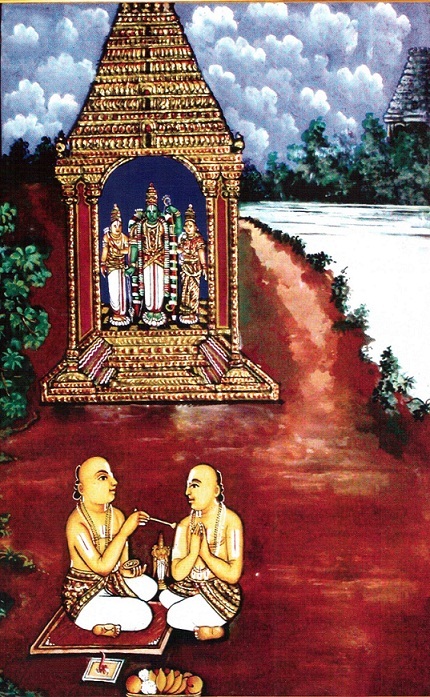 He then offers his sishya embAr to udayavar and tells him "You have to think about udayavar more than myself; his lotus feet is the path; he has appeared to uplift everyone; Since I dont have the direct sambandham with him, I got it thru this srIrAmAyaNa kAlakshEpam. His glories are such that even ALavandhAr was filled with sorrow that he was unable to have association of him. By the grace of his relationship, you stay with him without ever separating from him". This is also the essence of our sampradhAyam. When udayavar went to thirukkOshtiyUr (18 times) and heard charamaslOkam from thirukkOshtiyUr nambi, after explaining the essence of the charama slOkam (Eka shabdham), nambi says "Dont mind that I have troubled you so much to give these meanings, I have done this to express the great value of these manings. You have appeared to uplift the entire world. nAthamunigaL had you in his heart all along. The fact that I have this relationship with you makes me not worry about the ultimate goal. Even though there were many capable sishyas for ALavandhAr who could lead the sampradhAyam, he surrendered to dhEva perumAL requesting him to make you the leader of our sampradhAyam. When he was ascending to paramapadham, he was very saddened that he could not have your association even for a small moment. This dharisanam is going to be famously known by your name as emperumAnAr dharisanam and is going to reach great heights". thirumAlai ANdAn was giving kAlakshEpam to udayavar based on orders of thirukkOshtiyUr nambi. During that time, there were differences of opinion between thirumAlai ANdAn and udayavar, and ANdAn stops the kAlakshEpam due to that. Hearing this, thirukkOshtiyUr nambi rushed to srIrangam and tells ANdAn that "Dont think that you are teaching him something he does not know. He will only present the same ideas which were presented by ALavandhAr. Just like kaNNan emperumAn learnt vEdham from sAndhIpani, he is learning thiruvAimozhi meanings from you". 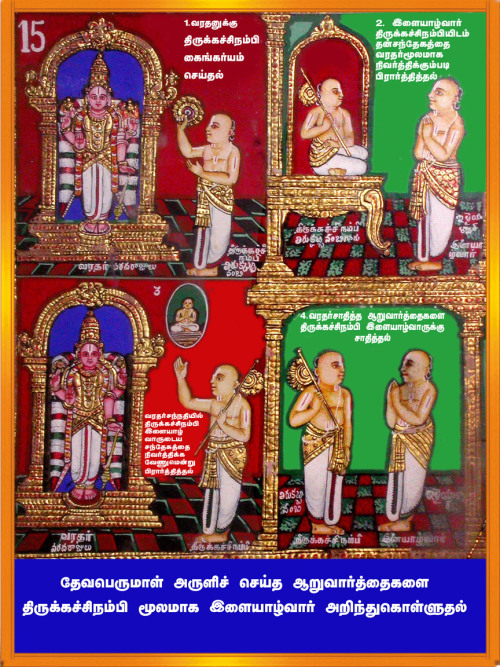 The kAlakshEpam then continues with the presence of thirumAlai ANdAn, thiukkOshtiyUr nambi and periya nambi. In "poliga poliga" pAsuram, while "kaliyum kedum" is explained, thirukkOshtiyUr nambi looks at udayavar with great reverence and udayavar asks why does he look at him like that. nambi replies "Why should you even ask this question when actually you are the one who has appeared to prove the words of AzhwAr? You (who is the leader of prapanna kulam) are the actual meaning for this pAsuram. You have descended from paramapadham just to uplift all of us". Hearing this, thirumAlai ANdAn becomes ecstatic and declares "From now onwards, I will consider yourself as ALavandhAr; you are the path for my ultimate goal". udayavar performs loving service to thiruvaranga perumAL arayar and pleases him very much. arayar explains him all the intricacies of charamOpAyam (understanding AchAryan is everything) and udayavar is very happy to learn them. At that time, arayar tells udayavar "Even though I have taught you the secret meanings of charamOpAyam, you are practically the object of these meanings. And since this confidence comes down to us from nAthamunigaL, there is no doubt that you are the uplifter of the entire world including us". Thus, even though these 5 AchAryas (periya nambi - mahA pUrNar, periya thirumalai nambi - srIsaila pUrNar, thirukkOshtiyUr nambi - gOshti pUrNar, thirumAlai ANdAn - mAlAdhArar and thiruvaranga perumAL arayar) taught many meanings to udayavar, they were firmly situated that udayavar is their uplifter. thirukkOshtiyUr nambi gets her daughter to surrender unto udayavar. udayavar out of his causeless grace shows here his divine lotus feet and tells her that she should always depend on his lotus feet. periyavAchAn piLLai identifies that She replies to udayavar that "Wherever you are, I will be fully surrendered at your lotus feet. Seeing how my father thinks about you, should you even ask about me who is fully surrendered to you only?". During his final days, thirukkOshtiyUr nambi asks "Dear daughter! What are you thinking about now during my last moments?". She replies "Dear father! I am thinking that by the grace of my AchAryan (emperumAnAr) you are achieving the ultimate goal (of reaching paramapadham) now (ahead of me)". nambi is very pleased with here and he presents her the bhavishyadhAchAryan vigraham that was given to him by ALavandhAr. Finally he says "emperumAnAr thiruvadigaLE thanjam" and ascends to paramapadham. Thus he clearly established the uththarakathvam in emperumAnAr without any doubt. thirukkachi nambi while serving dhEva perumAL through the night with thiruvAlavatta (fan) kainkaryam, pEraruLALan asks nambi "nambi! looks like you want to say something" and nambi replies "nAyinthE! iLayAzhwAr said he had some confusions in his mind and he wanted clarification from you, please clarify them". pEraruLALan says "Am I going to say something he does not know? Just like I studied under sAndhIpani, he is also like that. He is an expert in all the sAsthrams and upAyams, one who knows the essence, who is the leader of nithya sUris, who can teach and uplift the whole world, what is that I can tell him? He is asking this through you as if he does not know the answers himself". A doubt arises here - udayavar is the sishya of these 5 AchAryas. Them being AchAryas and him being sishya, how is that it is said that "their ultimate goal is accomplished by their relationship with udayavar. Generally AchAryan's sambhandham which will give the benediction for the sishya - here it is reversed". Just like when srIrAman, kaNNan emperumAn, etc who were born as the son of dhasarathan, vasudhEvan, etc., they accepted viswAmithra, sAndhIpani as AchAryas and they voluntarily placed themselves under them as per srI rAmAyaNam "kinGkarau samupasthithau" (கிங்கரௌ ஸமுபஸ்திதௌ) meaning "Oh! viswAmithra! we are right here to serve you" and "thavAham dhAsabhUthOSsmi kimadhya karavAnNi thE" (தவாஹம் தாஸபூதோSஸ்மி கிமத்ய கரவாணி தே) meaning "I am your servant! what can I do for you?". Even though they were sishyas under those AchAryas, ultimately vishwAmithra and sAndhipani were the ones who benefited through those relationships. The same way, the 5 AchAryas benefited through their relationship towards emperumAnAr. In mahAbhAratham it is said that "vishnNur mANusha rUpEnNa chachAra vasudhAthalE" (விஷ்ணுர் மாநுஷ ரூபேண சசார வஸுதாதலே) meaning Lord vishNu walks around the world in a human form. Oh gOvindhA! For the benefit of the whole world you are now residing in dhvArakai in a human form. Thus, these AchAryas of emperumAn benefited by their relationship with emperumAn. The same principle can be applied in the case of emperumAnAr also. As per "AchAryassa harissAkshAth chararUpI na samchaya:" (ஆசார்யஸ்ஸ ஹரிஸ்ஸாக்ஷாத் சரரூபீ ந ஸம்சய:) meaning AchAryan is the same parabrahmam - hari who is walking in front of us, "gururEva param bhrammam" (குருரேவ பரம் ப்ரம்மம்) meaning AchAryan is the supreme lord, "pIthakavAdaip pirAnAr biramaguruvAgi vaNdhu" (பீதகவாடைப் பிரானார் பிரமகுருவாகி வந்து) meaning emperumAn who wears yellow/silk cloth appears as the AchAryan and "thirumAmagaL kozhunan thAnE guruvAgi" (திருமாமகள் கொழுனன் தானே குருவாகி) meaning the husband of srImahAlkshmi becomes the AchAryan, emperumAnAr is also an avathAra visEsham (a special incarnation). 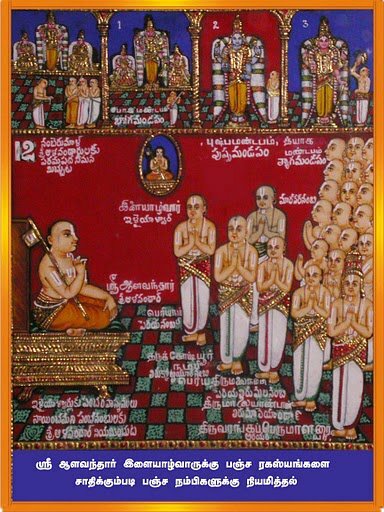 His 5 AchAryas became AchAryas to him to get his sambhandham (relationship) instead of teaching something unknown to him and because they were constantly meditating on the greatness of emperumAnAr as explained by nAthamunigaL through the AchArya paramparai, they fully estalished uththArakthvam in emperumAnAr. If we can explain the fact that emperumAnAr is the uththArakar for prathamAchAryan (emperumAn), we can easily explain his uththArakathvam for every one else. uththArakathvam means taking the one who have lost his svarUpam (true nature) and svabhAvam (qualities), reinstating the original svarUpam and svabhAvam and uplifting him. bhAhyas (avaidhikas like boudhdhas and chamanas who dont accept vEdham as sAsthram) and kudhrushtis (vaidhikas like advaithis who accept vEdham as sAsthram but give wrong interpretations) destroyed the svarUpam and svabhAvam of parabrahmam. emperumAnAr, using the vEdha sAsthram, defeated these bhAhyas and kudhrustis and re-established the svarUpam and svabhAvam of parabrahmam and thus uplifted emperumAn. Further more, just like nAradha bhagavAn said "gOpAlam yAdhavam vamcham svayam magNam abhyudhdharishyathi" (கோபாலம் யாதவம் வம்சம் ஸ்வயம் மக்நம் அப்யுத்தரிஷ்யதி) meaning kaNNan emperumAn will appear as gOpAlan and will uplift the yAdhava vamsam by his acts, AzhwAr who is the prapanna jana kUtasthar foreseeing emperumAnAr's avathAram, declared that "kaliyum kedum kanNdu konNmin" (கலியும் கெடும் கண்டு கொண்மின்) meaning "See for yourself that kali will be destroyed" and said that a great person will appear and will take the prapanna kulam to great heights with lots of srivaishnavasri. That is why, even though many great AchAryas like ALavandhAr were present, the sampradhAyam is named after emperumAnAr and had great following with 74 simhAsanAdhipathis, many highly knowledgable sannyAsis, many srivaishnavas, EkAngis (constant servitors), many knowledgable srivaishnavis (ladies), etc. That srivaishnavasri is glowing and growing even today as rAmAnuja dharisanam. In the next section, we will see emperumAnAr's avathAra rahasyam revealed by many great personalities. Left with tears of joy after reading this swami.